Grape Pitcher in Vaseline, Bargain Shack offers Boyd Glass, Mosser Glass, L.G. Wright, and Contemporary Collectible Glass including Vaseline Glass - J.B. Scottie Dogs, Pooche, Animal Covered Nests, Toothpick Holders, Salts, Glass Animal Figurines, Clowns, Dolls, Slippers, Vehicles, and More! 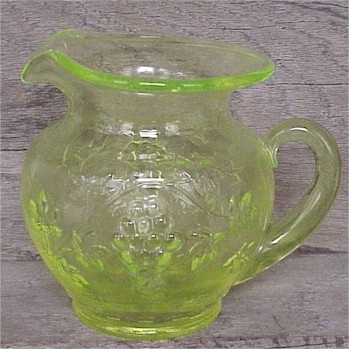 This Grape Pitcher is so beautiful in vaseline with its raised grape and leaf pattern! This pitcher stands 5-3/4" tall and measures 7" wide from spout to handle. The bottom of this pitcher is marked Gibson 2000.